6. AMY'S I think Amy's Natural & Organic meals are groovy!! Everything they produce is vegetarian, and many are vegan. They're all organic, easy to heat and serve, and darn tasty to boot! Amy's vast array of vegan options range from breakfast steel-cut oats to tofu scramble to Asian noodle stir-fry to vegetable enchiladas to veggie burgers, pizza, chili, baked ziti and even chocolate cake (and that's just to name a few)!! My personal fave is Amy's vegan "Family Marinara" Sauce - which is a fantastic addition to noodles, quinoa, beans, sauteed veggies and just about anything else you can think of! 7. MAUK FAMILY FARMS I've been a fan of Mauk Family Farms products for a while now. This company makes some really delectable Flax Seed crackers (my favorite flavor is "Garlic Onion") as well as two other great products called "Wheat Free Crusts" (brown and golden flax seeds, sesame seeds, sunflower seeds, celery seed, garlic, onion, red bell pepper, parsley, sea salt & water) & "Breakfast Crusts" (pumpkin seeds, black/white sesame seed,golden flax seed, garlic, onion, dulse flakes & sea salt). They have no grain or gluten and are rich in Copper, Magnesium & essential fatty acids. These crusts are totally addictive and perfect on their own... or try one of my favorite combo's and spread on some creamy coconut oil and you'll be in total ecstasy!! 8. ENJOY LIFE FOODS Searching for a food company that makes delicious snacks and is "sensitive" to the issue of food allergies? Enjoy Life Foods is that company; their mission is to create and sell cookies, trail mix, snack bars & baking products that are uber tasty, as well as free and clear of gluten, dairy, egg, casein, peanuts, tree-nuts, and soy... And that's exactly what they've done! My favorite products that they make are the "Happy Apple" & "No-Oats "Oatmeal"" cookies; They're moist, chewy, not-too-sweet, and just undeniably delicious! Founded by Shari, a very cool, health-conscious mom of three, 2 Moms In The Raw is a fantastic company that produces a yummy array of organic, raw Granola ("Blueberry", "Cranberry", "Gojiberry" & "Raisin") and Sea Crackers ("Garden Herb", "Pesto" & "Tomato Basil"). The "Garden Herb" Sea Crackers are definitely my favorite; consisting of Flaxseed, Kombu (Sea Vegetable), Rosemary, Thyme, Oregano, Sea Salt and Spices - they're light, crunchy, crisp and they taste like a fresh herb garden compressed into chip form! The "Tomato Basil" Sea Crackers are rad as well, made up of Flaxseeds, Sun-dried Tomatoes, Garlic, Kombu, Herbs & Sea Salt - they have a wonderful garlicky, sun-dried tomato bite! Both of these crackers are the perfect light-bite for kids and adults; enjoy them on their own or dip it! In addition to their delicious crackers, 2 Moms also sell raw Granola which rocks! Not your typical granola, a little more chunky, you can break it into little pieces and eat it like a breakfast bar. The two flavors I've tried, Blueberry & (Gluten-free) Gojiberry are free of refined sugars (substitute Agave) and instead are jam-packed with a ton of healthy ingredients (buckwheat, coconut, a plethora of seeds/nuts and more!! ), all of which have been soaked & sprouted to perfection; chewy, crunchy, semi-sweet and utterly delicious, countless textures and flavors awaken your taste-buds and take em' on one helluva' wild joy-ride! You can purchase 2 Moms In The Raw products at Shari's wonderful site: http://2momsintheraw.com/ or look for them at your local health food store. In addition to a full-blown gourmet vegan menu at their restaurant (located in Studio City, CA), Sun Power Natural has an awesome product line of raw cookies that I recently discovered at my local co op. The two flavors I've tried are "Cinnamon" (coconut, raisins, cinnamon & agave) & "Fruit Burst" (oranges, coconut, raisins, agave). These cookies are "chewy, gooey & delicious" and I definitely think Sun Power Natural has got it going on! In addition to tasting like heaven, these organic treats are raw, gluten-free & low glycemic. 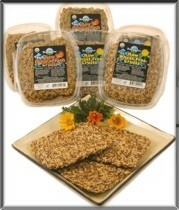 Look for SunPower food at your local co op and Whole Foods, or just click on this link (http://www.sunpowernatural.com/) and get some raw decadence in your life stat! I hope you enjoyed my 10 vegan product picks! In addition to these yummy snacks, try and balance your diet and combat any acidic/sugar intake by consuming tons of alkalizing greens and lots of pH balanced water. Here's to your health!